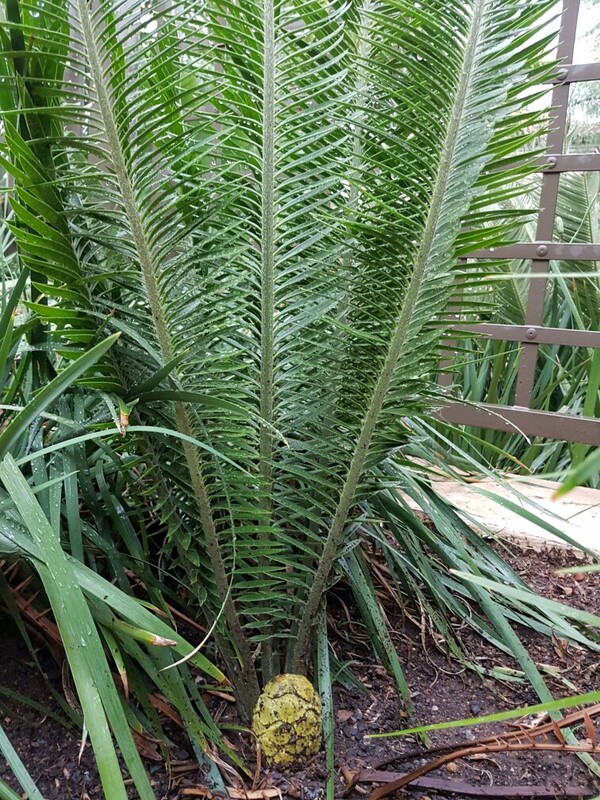 PREVIOUSLY KNOWN AS "ENCEPHALARTOS SPECIES SUDAN"
This cycad was discovered about fifteen years ago in southern Sudan in a desolate and dry area. This is an area seldom visited by enthusiasts. It has an overall height of about ten feet and freely suckers - many trunks decumbent on the ground. Leaves are green and about six feet long. Leaflets are an inch to an inch and a half wide. 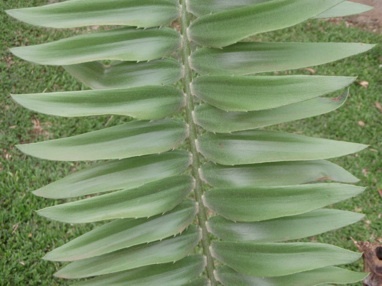 It's the wide leaflets that distinguish this species from other cycads in the region. Obviously, this is a very rare and unusual cycad species to find. Read below for more information on this species. Locality: This species is endemic to a remote part of southern Sudan and the northern part of Uganda. It is fairly new to cultivation and has not been a named species for long (named in 2009). Before it was described, this species was know as "Encephalartos species Sudan". There have been very few expeditions to this plants' locality and few/no studies have been done to determine its conservation. At this point the plant is considered threatened, but reports of poaching may indicate that the plant is more threatened than believed. (Donaldson, J.S. 2010. Encephalartos mackenziei) This species occurs in rocky hills and woodlands. The climate is hot and dry, but does get precipitation during the wet season in summer. Plant Size: This is a medium to large sized plant. Leaves can reach almost two meters in length (slightly shorter), and stems on very old specimens can get up to three and a half meters. This species produces suckers freely and can become quite large and full over time. Other Characteristics: The name 'mackenziei' was named in honor of Paul Mackenzie (well know cycad enthusiast and explorer in Nairobi). 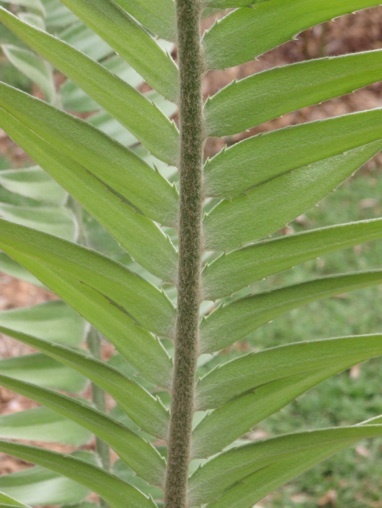 (The Cycads, Whitelock & Benadom) This species is similar in some ways to Encephalartos septentrionalis especially in younger plants, but differs in its ultimate size and in the length and width of its leaflets. The leaflets of this species are wide and moderately armed, and have a light coating of tomentum, which is more thick on new leaves. The petioles are wooly and are armed with spines and prickles. 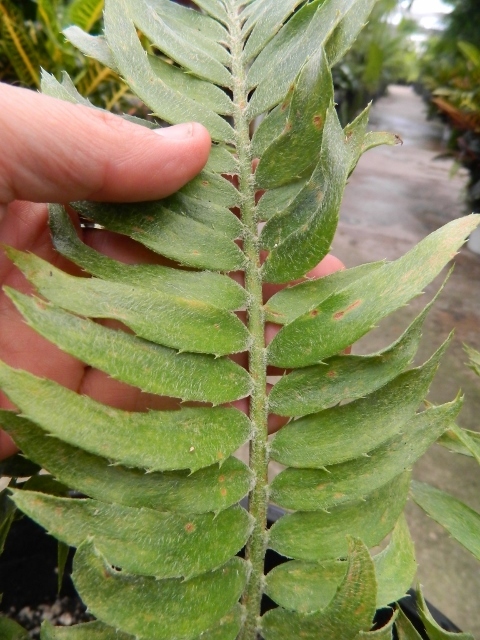 As with other northern (Central African) species with thin leaflet tissue, E. mackenziei is sensitive to cold. It is hardier than some species, but certainly not as hardy as the more robust Central African species and even less so to South African species of Encephalartos. This species has proven to be a moderate to slow growing plant in cultivation. It is quite attractive and can be grown in a subtropical climate (though it may need some protection in the winter). 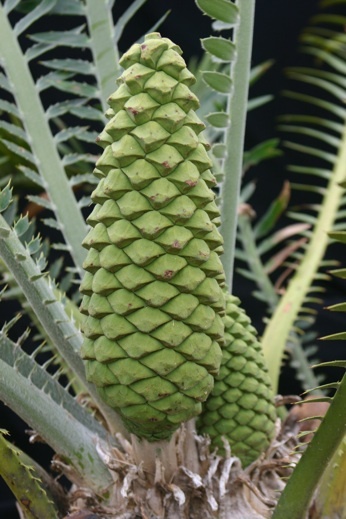 The both male and female cones are green when they emerge, becoming an olive green/brown color as they mature. Culture: In coastal and inland areas, this species should be in partial sun or filtered light. This may not be an easy plant to attempt in most desert areas. If you were going to try, this species would need to be in the shade or filtered light under protection. The species need s a soil that drains well. Landscape Usage: This is a beautiful plant and can really add not only beauty to you garden, but rarity. It will need some protection, so I do not recommend it for gardens that are new or for gardens with extreme weather. Availability: We, on occasion, have this species for sale. It is super rare and hard to find. Presently we may only have a few available. These are always is super short supply. Seeds have not been available lately. Give us a a call or email about the size you seek. 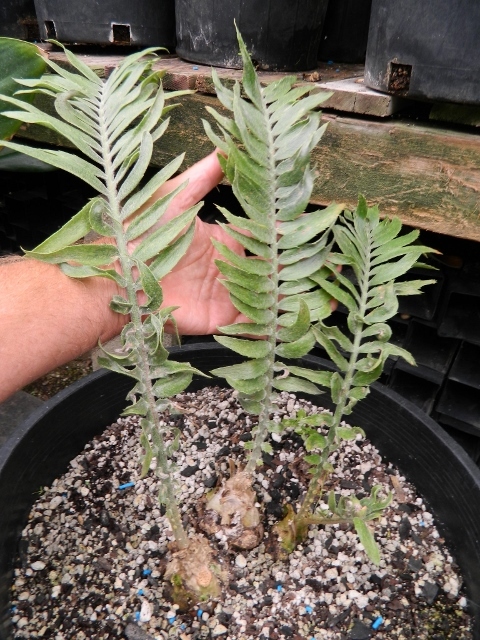 Pricing: Encephalartos mackenzei is a very rare species and tends to be quite expensive for a green leafed species. Encephalartos mackenziei is an extremely rare species and seeds have not been available for a while. Because of this we only have a few plants available for sale. 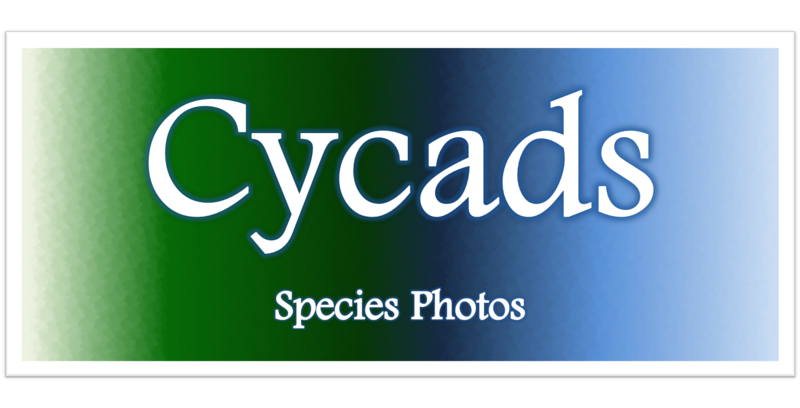 Please contact us if you are interested in this species.